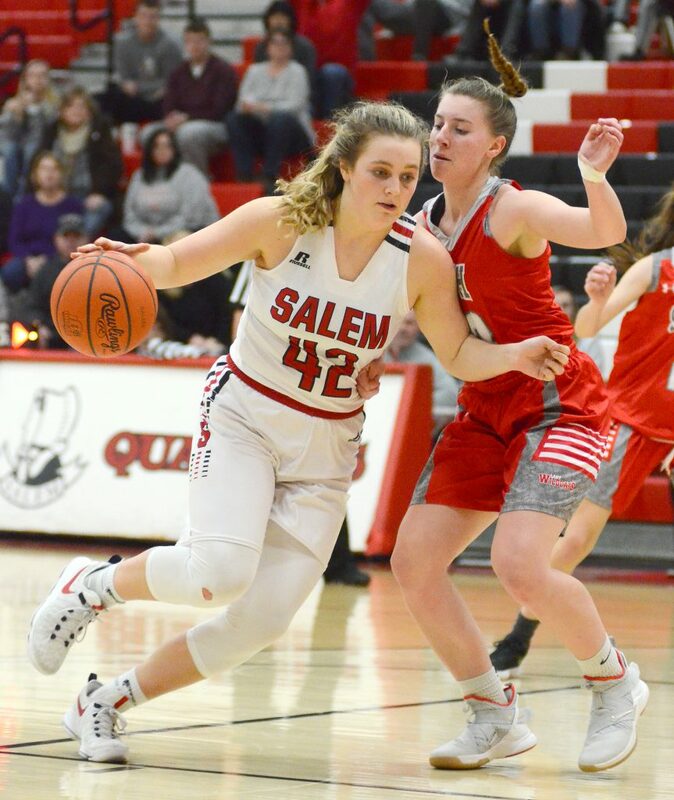 SALEM — Sophomore Annie Davidson scored all six of her points in the fourth quarter as Salem rallied past Canton South, 39-38, Saturday afternoon. Kyla Jamison had a game-high 15 points and five rebounds. Echo Mayer-Kutz contributed 11 points, eight rebounds and seven steals and Ellie Davidson had six points, eight rebounds and nine rebounds. Annie Davidson added three assists and three steals. 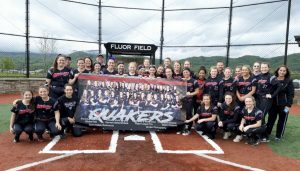 The Quakers improve to 11-4 overall and 6-1 in the Eastern Buckeye Conference, while the Wildcats drop to 10-3 and 3-3 EBC. Salem trailed 29-27 heading into the fourth quarter before rallying for the victory. The Salem junior varsity team ended the game on a 14-0 run for a 33-25 win. The Quakers (14-2) got nine points from Jenna McClish and Krista Barley. Salem will travel to Alliance on Wednesday for a varsity-only matchup. CANTON SOUTH SCORING: Morgan Dalton 1-1-3, Alex Brown 1-0-3, Rachel Porter 2-0-5, Megan Mitchell 4-0-9, Makayla Smith 4-0-9, Sophia Talkington 3-0-6, Cheyenne Comer 0-2-2, Brooke Myers 0-0-0, Toni Denmark 0-0-0, Hayley Miller 0-1-1. TEAM TOTALS: 15, 4-9: 38. SALEM SCORING: Casey Johnson 0-0-0, Taylor Troy 0-0-0, Annie Davidson 2-1-6, Ellie Davidson 2-2-6, Echol Mayer-Kutz 4-2-11, Kyla Jamison 5-5-15, Jessica Slocum 0-0-0, Paige Bailey 0-1-1, Jaden Hamilton 0-0-0, Hayden Carner 0-0-0. TEAM TOTALS: 13, 11-15: 39. Three-point goals: Canton South 4 (Brown, Porter, Mitchell, Smith), Salem 2 (A. Davidson, Mayer-Kutz). ALLIANCE–The West Branch defense wore down Marlington in the second half as the Warriors claimed a 50-38 victory in Eastern Buckeye Conference action Saturday. West Branch trailed 30-20 at halftime, before clamping down and outscoring the Dukes 30-8 in the second half. The seventh-ranked Warriors improve to 10-3 overall and 6-0 in the EBC. The Dukes fall to 4-9, 2-5. Peyton Alazaus led the West Branch scoring output with 16 points, she also hauled in nine rebounds. Also for the Warriors, Jessica Bock and Grace Heath each contributed 10 points. West Branch dominated the rebounding battle 42-20. The Warriors won the JV game 41-25. West Branch hosts Garfield Monday. WEST BRANCH SCORING: Carly Scarpitti 1-0-2, Grace Heath 4-2-10, Sammie Tuel 1-1-3, Emma Egli 0-0-0, Riley Tuel 0-0-0, Elizabeth Ostadali 0-0-0, Maddie Showalter 2-2-6, Anna Lippiatt 1-0-3, Jillian Pidgeon 0-0-0, Peyton Alazaus 5-3-16, Jessica Bock 4-2-10. TEAM TOTALS: 18, 10-13: 50. MARLINGTON SCORING: Ferrett 1-0-2, Springer 3-0-8, Lacher 3-2-9, Mason 2-2-6, Thompson 1-0-2, Coustontino 1-0-2, Lepley 3-2-9. TEAM TOTALS: 14, 6-7: 38. Three-point goals: West Branch 4 (Alazaus 3, Lippiatt), Marlington 4 (Springer 2, Lacher, Lepley). MINERVA–The Minerva girls basketball team blew out Alliance 53-14 in Eastern Buckeye Conference action Saturday. The Lions improve to 10-2 overall and 5-2 in the EBC. Elyssa Imler led Minerva with 12 points. Gina Slentz added 10 points. Addie Rhodes finished with eight rebounds. Minerva is at Tusky Valley Monday. ALLIANCE SCORING: Quick 0-0-0, Tolley 1-0-3, Mandy 1-2-4, R. Thomas 3-0-6, M. Thomas 0-1-1. TEAM TOTALS: 5-3-14. MINERVA SCORING: Foutz 1-0-2, Yankovich 3-0-6, Kendrick 0-2-2, Imler 4-2-12, Walton 3-2-10, Miller 3-0-7, Rhodes 2-0-4, Slentz 5-0-10. TOTALS: 21, 5-6: 53. Three-point goals: Alliance 1 (Tolley), Minerva 6 (Walton 3, Imler 2, Miller). LOWELLVILLE — Ari Russell collected 15 points and 10 rebounds in leading Leetonia past Lowellville, 47-27, Saturday. Anna Buffone dished out three assists for the Bears, who improve to 8-5 on the season. For the Rockets, Maliyah Hedrich had 10 points and 10 rebounds. The Bears also won the two-quarter junior varsity game, 17-15. Leetonia will host East Palestine on Monday. LEETONIA SCORING: Anna Buffone 1-3-6, Kylie Tullis 1-2-4, Taran Ferry 3-1-7, Kalie Eastek 3-0-6, Ari Russell 7-1-15, Samantha Schneider 0-5-5, Haleigh Brock 2-0-4. TEAM TOTALS: 17-65, 12-15: 47. LOWELLVILLE SCORING: Marah Bellis 0-2-2, sam Moore 2-5-9, Maliyah Hedrich 4-0-10, Julianna Lellio 2-1-5, EmmaLee McGarry 0-0-0. TEAM TOTALS: 8-24, 9-18: 27. Three-point goals: Leetonia 1 (Buffone), Lowellville 2 (Hedrich 2).